The Daggerfall Covenant was a military alliance between the High Rock kingdoms of Camlorn, Daggerfall, Evermore, Shornhelm, and Wayrest, the northern Hammerfell kingdom of Sentinel and the city of Hallin's Stand, and also Orsinium during the chaotic Interregnum of the Second Era. It vied with the Aldmeri Dominion and Ebonheart Pact for control over the contested Ruby Throne in Cyrodiil. The Covenant saw itself as the successor to the Reman Dynasty and aimed to restore the Second Empire with the legitimacy to rule all of Tamriel. They advocated economic prosperity and the worship of the Divines. In this mission it was led by a Royal Council, presided over by High King Emeric, a Breton merchant lord of superb diplomatic skill. The Redguards were represented by King Fahara'jad, and the Orcs by King Kurog gro-Bagrakh. A Daughter of Coldharbour is a female individual who has been granted vampirism through a ritual with the creator and patron deity of vampires, Molag Bal. The term comes from Coldharbour, the plane of Oblivion that Molag Bal lords over. Being pure-blooded, all Daughters of Coldharbour are also powerful Vampire Lords. The first Daughter of Coldharbour can be roughly dated back to at least the early First Era. Lamae Beolfag was a Nedic virgin who was raped by Molag Bal. Legends recount that after the ordeal, Molag Bal shed a droplet of blood upon her brow and left her to die. During the night she passed into death, but as her funeral pyre was still burning she emerged as the first pure-blood vampire. Since Lamae, a tradition developed among cults worshipping Molag Bal which dictated that women be offered to him on the 20th of Evening Star, his summoning day. Few survive the ordeal and those who do emerge as pure-blooded vampires. Being selected as an offering was considered to be an honor that was not rejected lightly. The Dawnguard are known as a group of vampire hunters based out of Fort Dawnguard in the Rift. In the Second Era, the Jarl of Riften formed the Dawnguard and had Fort Dawnguard built in order to house and monitor his son, who had contracted vampirism. The group expanded upon this mandate and became vampire hunters who traversed all of Skyrim to ferret out their enemy. Eventually, they became victims of their success: the group was disbanded, and their fort was left abandoned, once the populace no longer feared the vampire threat. It is said that they eventually had to kill the Jarl's son, leading the Jarl to banish them from the hold. One legend claims that the Dawnguard were awed by the power of the Jarl's son and eventually decided to become vampires themselves. They preyed on the Rift until someone put a stop to them. In the Fourth Era, the Dawnguard was reformed amid rumors of an increase in vampire activity in order to hunt them down and thwart their nefarious plans. The Direnni were an aristocratic clan of Altmer merchants who became a powerful dynasty ruling over High Rock for hundreds of years. They formed the Direnni Hegemony, a loose area of influence around the Isle of Balfiera. The Dissident Priests are a secretive cult consisting of Tribunal Temple members who dispute the Temple's dogmatic foundations and question the process of the Tribunal's elevation to become gods. They argue Temple doctrine and are uneasy about the practices of the Ordinators. One of the chief disputes between the Temple and the Dissident Priests is that the Temple hides the truth from its followers. The Dissident Priests' outline and their beliefs are manifested in the book Progress of Truth. The Dissident Priests consider the Ashlanders' prophecies of the Nerevarine as a topic worth studying. However, their views differ from those of the Temple hierarchy, and they were persecuted and driven into hiding. The priests study and comment on the Apographa, which are known as 'the hidden writings'. This is opposed to the Hierographa, which are the 'public writings' of the Temple's dogma. These hidden writings contain secrets known only at the highest levels of priesthood and inquisition. They gathered as much of the Apographa as possible in their base, a secret monastery called Holamayan hidden in the wastes of Azura's Coast that was protected by a magical barrier. The Priests are not only committed to gather information and argue about the Tribunal's background, but they also seemed to actively compete with the Ordinators on how to effectively confront Dagoth Ur. According to their leader Gilvas Barelo, the Priests sensed the despair within the people of Vvardenfell. They followed a practical approach to which the common folk could look up to and to spread hope by turning to the ancient pillars of faith and the prophetic visions of their Nerevarine. The Dissident Priests hoped for the Temple's and the people's support once they had shown their ability to confront Dagoth Ur efficiently. The Divine Prosecution are a division of the Thalmor. They stand as the highest authority of law and order on Summerset Isle, second only to the Queen and her Royal Court. They serve as a state-level law enforcement organization tasked with enforcing not just the temporal laws, but also the religious laws of the Altmer. They target what they perceive to be heresy and among that is Daedra worship. The Divine Prosecution are wary of outsiders but were seen deputizing skilled adventurers during the Second Era to handle dangerous threats. The Dragon Cult began as a sect within the traditions of animal worship brought by Atmorans to Tamriel. Certain scholars believe these were "totem animals" for the modern Divines; in which case, worship of the dragon corresponded to worship of Akatosh. Dragons were revered more than any other, and they were comfortable in assuming positions as god-kings over men. Their servants, the dragon priests, kept the peace between dragons and men, and their power was so great that uttering any word for "dragon" was forbidden to all mankind except them. They made laws for the society of men, and were on par with kings. Grand temples were built to honor the dragons and appease them in life and death, many of which survive as draugr-infested ruins today. The dragon priests were promised eternal life for their service, which they receive by absorbing the life force of their servants over the millennia. Some time during or soon after the migrations to Tamriel, the dragon cult began to assert more influence and become much more malevolent. From their capital Bromjunaar in modern-day Hjaalmarch, they ruled Skyrim with an iron fist, effectively enslaving the populace. While what led to this change was lost to historians, it was likely caused by Alduin, the First-Born of Akatosh and leader of the dragons, who had chosen to forsake his role as World Eater in favor of conquering Mundus for himself. Men eventually rebelled in the late Merethic Era, leading to the ancient Dragon War. Men, with the help of several dragons, eventually secured victory with the defeat of Alduin. The dragon priests were overthrown and dragons were slaughtered in large numbers before fleeing to remote areas. Though they had lost their god-kings and were cast out of mainstream Nordic society, the dragon cult managed to adapt and survive for centuries. Whenever they could lay hands on the remains of a dragon, they would build a tomb for it known as a "dragon mound", a practice they maintained for centuries after the war. They believed that one day the dragons would rise again and reward the faithful. 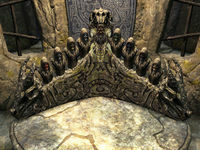 When the priests of the Eight Divines arrived in Skyrim in the First Era, they found it very difficult to convert the Nords, in part because the Nords had abandoned the worship of the dragon along with the dragon cult. Thus, they only knew of the Great Dragon, Akatosh, as the elven god Auriel, whom they despised as a demon. The missionaries were able to allay some concerns by claiming that Alduin and those who followed him had acted against the wishes of Akatosh, and it was his intervention that led some dragons to assist men against their brethren. The dragon cult was eventually driven extinct, surviving only in the form of draugr who continue to prowl ancient ruins. The last known holdouts were discovered and besieged in the monastery of Forelhost in the mountains of the Rift by the forces of High King Harald, eventually committing mass suicide in 1E 140. This article is about the class of warriors. For the chivalric order, see Knights of the Dragon. The Dragon Knights (or Dragonknights) were followers of a new martial tradition that emerged during the Interregnum of the Second Era, originating from the dispersed Akaviri Dragonguard. Their abilities were said to descend from the powers of dragons, although none had been seen in Tamriel for thousands of years at that time. They were particularly skilled at manipulating fire, and could wreathe themselves in it completely without being harmed. A Dragonborn (or Dovahkiin) is a mortal blessed with the Blood and soul of a dragon by Akatosh, the Father of Dragons and chief of the Divines. Those with the blessing have an extraordinary aptitude in the use of the thu'um, being able to absorb knowledge of shouts directly from the souls of slain dragons. This ability breeds fear and hatred in dragons, as the removal of their soul severs their immortality and renders them beyond the reach of any necromancy. The first known Dragonborn was Miraak, a dragon priest of the Merethic Era who used the thu'um in an unsuccessful revolt against his masters. However, the title itself is most often associated with the "Dragonborn Emperors" of Tamriel, who were in a divine covenant with Akatosh which maintains the barriers between Mundus and Oblivion. The Drothmeri Army was an army of mercenaries led by renegade Telvanni Arch-Mage Frathen Drothan. The army was assembled in secret on the border between Cyrodiil and Morrowind with the goal of destroying the Empire. Most residents in the hidden Drothmeri village were Dunmer, although some Khajiit and Argonian laborers were also employed. The Drothmeri Army was mostly wiped out at Sundercliff Watch while Drothan was trying to excavate Mehrunes' Razor. The Dro-m'Athra are a very dangerous and seductive reflection of the Khajiit. They are Khajiiti individuals who become corrupted during their life, resulting in their souls being claimed by Namiira. Upon death these souls are ultimately lost to the Daedric prince. This page was last modified on 21 October 2018, at 07:06.